Celtic skipper Scott Brown has revealed that Oliver Burke is the quickest player he has ever played with in his entire career. The Hoops booked their place in the quarter-final of the Scottish Cup with a resounding 5-0 win over St Johnstone at Parkhead on Sunday. 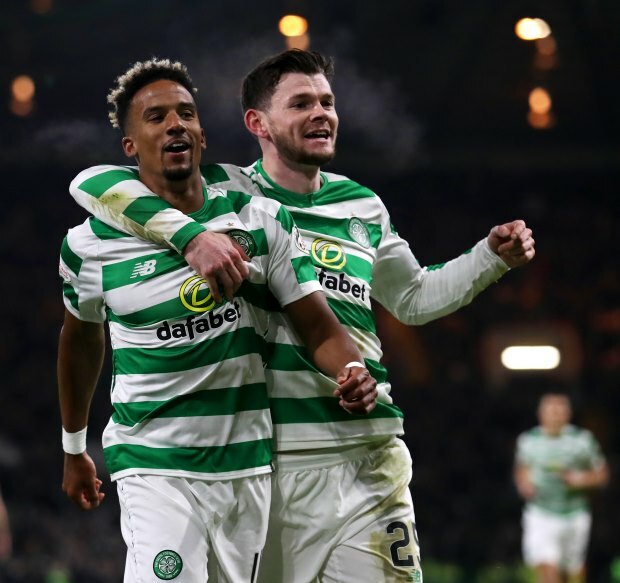 Brendan Rodgers’ men cruised to a win courtesy of goals from Scott Sinclair (three), Brown and James Forrest to maintain their unbeaten start since the turn of the year. Despite Sinclair grabbing the headlines with his scintillating hat-trick, it was Burke who caused a number of problems for Tommy Wright’s men due to his pace. And Brown was quick to heap the praise on Burke, who grabbed two assists against St Johnstone, by revealing the West Brom loanee is the quickest player he has ever played with in his career. “Oliver Burke is by far the quickest that I’ve played with”, Brown told the club’s official website. “He knows nine times out of 10 he’s going to beat anyone for pace and Scotty was in the right place as well. The Bhoys skipper also lauded the pace Celtic have at the moment and stressed that it is a factor that scares most teams that take the field against the Scottish champions. “With our forwards, we have pace everywhere in Ollie, Scotty, James and Timo [Weah]”, he continued. “We have pace all over the park and if scares people more than anything. “If people want to press the game we have that long pass in-behind that Ollie, Timo, James and Scotty can take up and run through on goal." Celtic begin their Europa League knockout stage campaign on Thursday when they host Spanish outfit Valencia at Parkhead.